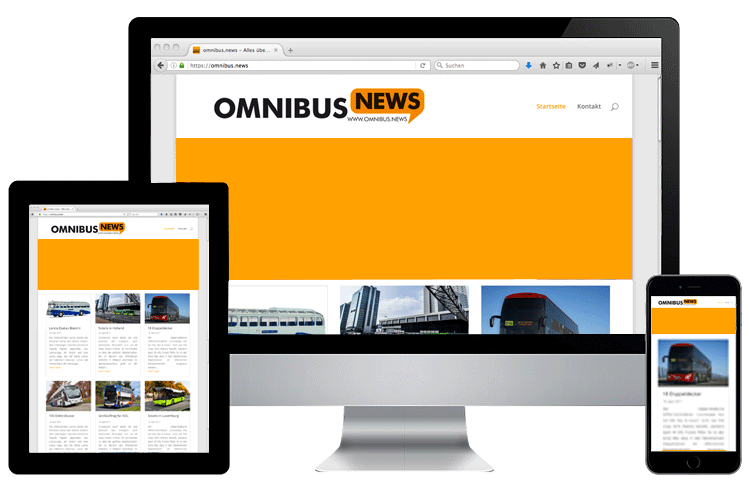 OMNIBUS.NEWS is one of the most important online magazines in the bus industry and celebrates its 10th anniversary in 2018. 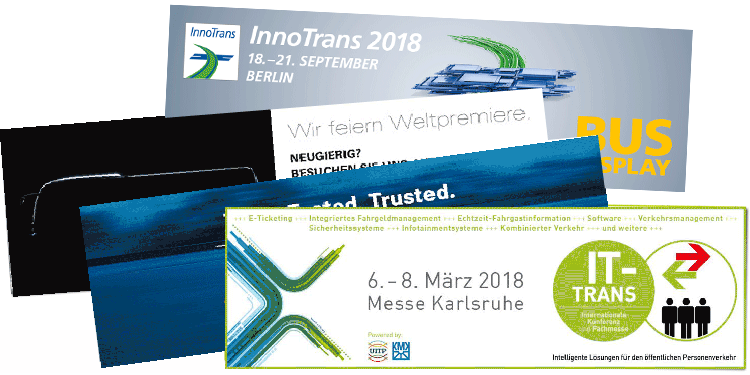 OMNIBUS.NEWS reports daily with several reports about events and developments in the bus sector – and from all over the world. The messages are explained with backgrounds and contexts – short, competent and free. Many reports are exclusively prepared, self-researched and understandable and formulated to the point. 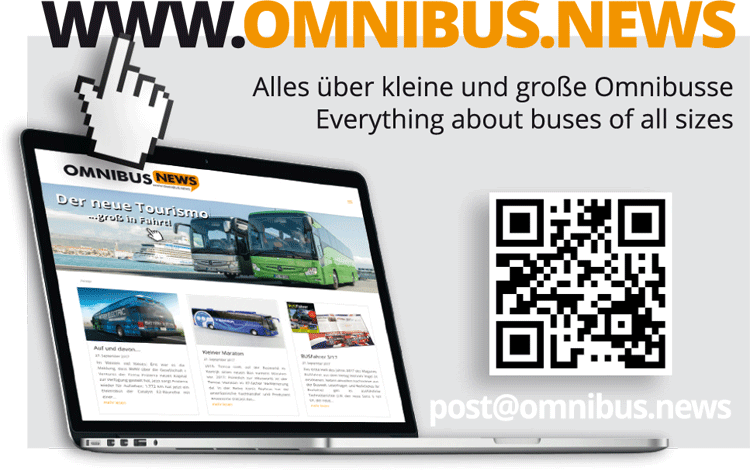 OMNIBUS.NEWS is being developed in collaboration with the editorial office SCHREIBERtext, which specializes in buses and coaches. OMNIBUS.NEWS supports entrepreneurs and executives of the bus world with tips for everyday business. OMNIBUS.NEWS automatically communicates all messages automatically at the time of publication via Twitter and Facebook. Each message can be printed, saved as a PDF, shared on Facebook, WhatsApp, Skype or Google+. In addition, an RSS feed is offered. Well over three quarters of all readers of OMNIBUS.NEWS work in executive positions in the companies. They are owners, managers, engineers and have a high degree of decision-making authority. A reader structure analysis (05/2017, 1,346 participants) revealed that readers at OMNIBUS.NEWS value daily reports and supplemental reports as well as understandable information. They judge OMNIBUS.NEWS as an important information medium for their daily work. 9 out of 10 readers would recommend the OMNIBUS.NEWS, 86 percent rated the coverage as objective, critical and factual. 7 out of 10 readers use the links in the messages for further information. Also the optically appealing, clear design as well as the messages available on all mobile terminals are appreciated by the readers. In February 2018, OMNIBUS.NEWS recorded a total of 8,615 visits for 29,832 page impressions during week number six of the year. The users are not only from Germany, but from Europe and the whole world. Short description: OMNIBUS.NEWS reports on news from the world of small and large buses and coaches. Events and developments in the bus sector from all over the world are explained with backgrounds and contexts – short, competent and free. Many reports are exclusively prepared, self-researched and understandable and formulated to the point. All messages are automatically communicated via Twitter at the time of publication. Each message can be printed, saved as a PDF, shared on Facebook, WhatsApp, Skype or Google+. 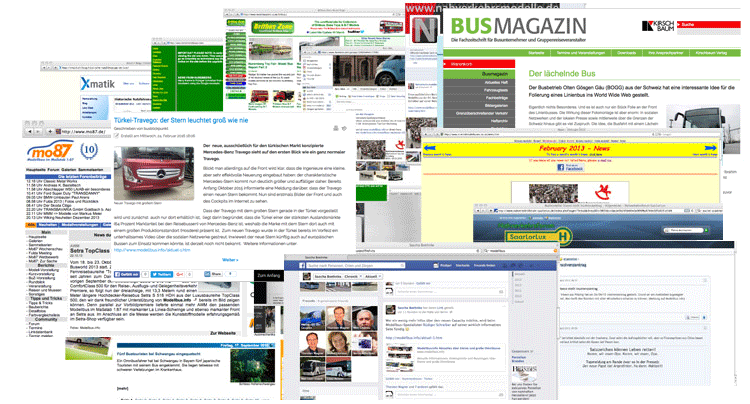 Extensive website for the bus industry. With daily updated news from the fields of technology, coach tourism, transport, politics and associations, in addition laws and regulations with omnibus relation as well as information and reports from the world of large and small buses. Decision makers from bus companies, transport companies, bus tourism and bus trade, engineers from industry. Data: JPG, JPEG, GIF (animated), PNG format- other formats available on request. Redirect and rich media tags possible, hiding the Google Adsense advertising for a fee. Special formats and special offers (among other things design of sliders, banners, etc.) by arrangement possible. Delivery time: At least 3 working days before the start of the shift. Placement (slider, page header or Rectangle) and duration of the overlay and style we discuss individually with you, please send an e-mail to post(at)omnibus.news! Thank you for your interest in the thoroughly researched topics on the OMNIBUS.NEWS website. Here are some clarifying words for the further use of the texts and images published here: The texts and images published on this website are subject to copyright and may not be published elsewhere without consultation. The acceptance of complete texts / articles / reports is subject to a fee! If you are interested, please send an e-mail to post(at)omnibus.news. If you only want to quote individual paragraphs from the texts / articles / reports of the omnibus.news website (up to 80 words), this is of course allowed free of charge and without further consultation. Obligatory here, however, is the source name “Source: omnibus.news”. Please do not forget to send a voucher copy to the postal address mentioned in the imprint or to the e-mail address. You need up-to-date footage of small or large buses for a publication? Then you are exactly right on omnibus.news. In addition, in our archives of the editorial office SCHREIBERtext, which specializes in buses, there are the exclusively made, professional and current photos of small and large buses for the pictures shown here. Of course, the right motif is also included in your publication. omnibus.news determines the optimal price for every use and budget size, because there are many different types of usage for photos – from private users to advertising agencies. For photo inquiries, please send an e-mail to post(at)omnibus.news. 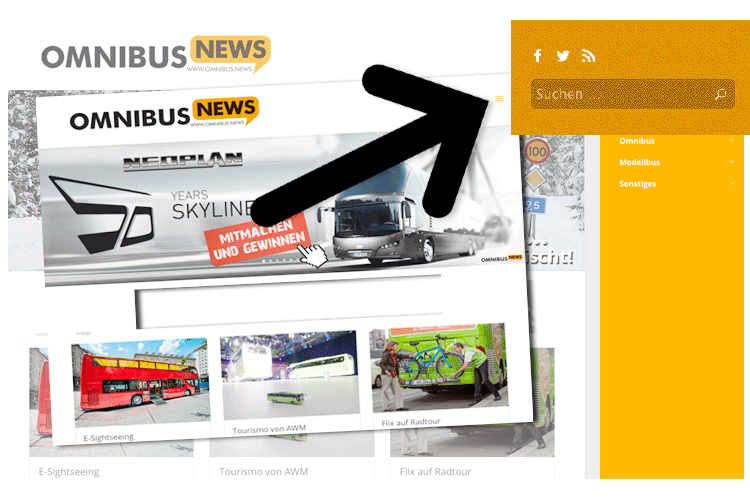 OMNIBUS.NEWS has become a fixture for information on small and large buses in German-speaking countries. On many other websites, social networks, forums and in newspapers, text and image contributions are already communicated by omnibus.news. Please note the notice on copyright (see above, note for journalists). omnibus.news does not want to compete with the established omnibus journals in the print sector, because test drives and technical reports as well as tourist information are not primarily the content of this website. More about copyright and trademarks and copyright in the imprint. You have suggested topics that OMNIBUS.NEWS should report on, or you want OMNIBUS.NEWS to share news about your business? Then send us an e-mail or include us in your mailing list. You have information for OMNIBUS.NEWS? Gladly, please send an e-mail to post(at)omnibus.news! Thanks to the manufacturers of small and large buses and coaches for the transferring information in word and picture and the model buses. Special thanks to all persons who contribute to the success of these pages through word and picture contributions, hints, tips, comments and other support. Carsten Poppen has created the basis for this CMS-based website with countless hours in the digital worlds, without his support and help OMNIBUS.NEWS would not have been able to start – thank you my buddy! OMNIBUS.NEWS is aimed at anyone interested in buses in public transport and coaches at the travel industry as well as other commercial uses. The contributions will be continuous – at least on the five working days of the week. For this OMNIBUS.NEWS sends a newsletter as a reading incentive. This ensures constant visitor numbers. An appropriate advertising banner will always be visible on all pages of the OMNIBUS.NEWS website. If you want to create a link to OMNIBUS.NEWS, you will receive a banner on request. For promotional measures there is a print volume for a flyer and various motifs of an advertisement – also on request. Please send an e-mail to post(at)omnibus.news! All news and reports as well as photos on omnibus.news can be easily searched for and found: With the magnifying glass as an icon – selectable in the top right of the menu. If you click on the three dashes in orange, you will still see the connections to the social media, because omnibus.news also distributes the messages on Facebook and Twitter. Just click, just as easy as subscribing to the RSS feed.